I am no great historian on the Civil War, but rather falling into a brief glimpse of what was happening at the time of early 1861 here in Frederick through various accounts. My journey began with searching old city ward maps and locating the history of a man and his fountain, which today still stands at Market and Seventh Streets. Col. Joseph Groff was a tremendous character, and made more so by his display of a large Union flag across Market Street at his store, later hotel, on North Market Street, now the location of the Carmack-Jay’s building. Background, April 1861: Baltimore is the scene of the first battles of the Civil War as mob fighting ensues against the Union forces paraded through town from railroad depot to railroad depot. The legislature is convened in Frederick instead of Annapolis or Baltimore because they are too strongly divided and the Confederate sympathy afire. Here, they vote down succession for Maryland. The spillover of passions in Frederick and the political divide, not much less, but the town is secured. His army passing through town, it misses passing by Barbara Frietchie’s house, turning from Bentz Street onto West Patrick, but it is said that Mary Quantrell waved a Union flag at him along Patrick Street. Jubal Early, farther back in the rebel line, reports that a fourteen year old girl waved a flag at curbside. The rebels are destitute, some barefoot. Farther north in town that same spring, Col. Groff has taken to displaying a large Union flag from his auction house and hotel property, and then stretches it across the street from rooftop to rooftop. He brought the thirty-four star flag from Philadelphia, where he had a hotel and stockyard prior to Frederick. Some Confederates are angered and threaten to remove it, they threaten to bring a certain Mr. Poffinberger, a noted combatant, to fight and take it down, but Groff meets them in the street, yelling He shouted out, "If any man took that flag down he would have me to whip first and if that man came in to do it, I would meet him." and the rabble-rousers recede and leave it in peace. Colonel Groff offers us one more defiant flag waver, in a town with plenty of patriotic fervor and Unionism. He noteably added his name to the roles of Republican party stalwarts. 1866 -- John Uhler walked on a wire stretched across the street from the Groff Hotel to the Koontz house. Mr. Uhler fell to the paved street and broke his arm and leg. Groff stopped in Woodsboro on his way to Gettysburg in 1863 to kiss his daughter good-bye. At Spangler's Spring during the battle of Gettysburg, at Spangler's Spring, Groff was wounded by a bullet in the right foot. He was given permission to return to his home in Frederick to have it removed. Capt. Groff kept the bullet. From his regiment 45 men were killed in battle and 86 died of wounds and disease. 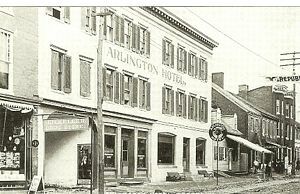 Later his hotel is known as Arlington House. The bar room floor was dirt until the 1890's. The front was expanded out twenty feet to the street. A livery stable was in back. IN the 1920's it becomes known as the Hotel Frederick. Groff's brickyard was at Eight and Market Streets. The bricks were used in homes on the east side of the 700 block of North Market Street. Groff House was built form those same bricks in 1884. Groff's house fronted twenty-eight acres, clubhouse, beer garden, a large private loop road with a pond and greenhouses where his son is said to grow flowers. It was known as Groff's Park. Groff Park also known as Schentzen Park. 1871 - the Union or Republican Party made nomination for councilmen, Mayor and Alderman at "Groff Hall" located on West 4th Street. 1885 - Groff partners in a "Frederick Colored Rink" - skating rink on 4th St. Groff Hall for the African American population. 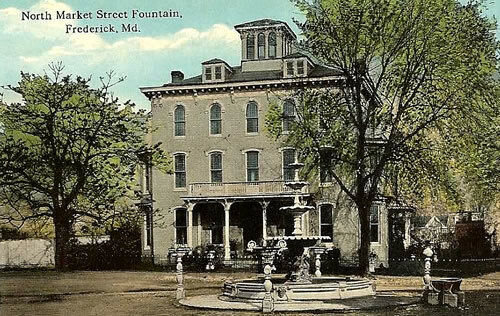 1891 - Fountain built by M. P. Morse across from the Groff home. His house in later years becomes the WFMD studios, with its mix of local country music, brother duos, Max Wiseman, and 1940’s style radio zaniness, ads and contests. In the early nineteen-seventies, its planned destruction is a preservation cause of the nascent Frederick County Landmarks Foundation. Groff's Fountain remains at roadside, once central to a traffic circle. A recent City charette looked at improving its site. Today, razed, sadly the house site remains a parking lot of limited purpose.